Me, Den Patrick, Pete Newman, Steve Aryan and Francesca Haig will be chatting nonsense and signing books. We all know each other far too well so this should be a good event, I think. The Citadel of Creos: silent, forbidden, haunted. No person in their right mind would attempt to explore it, but then, as Wydrin was fond of saying, adventurers are rarely in their right mind, especially when large amounts of coin are involved. For the young Lord Frith, the secrets within are his key to a bloody revenge; for Sebastian, exiled from his order for crimes he’d rather not talk about, thank you very much, it is a distraction from his recent disgrace. And Wydrin? For Wydrin it means fortune and fame, or at least the seeds of a good story she can embellish later. But something ancient and hungry lies restless in the hidden depths of the Citadel, and the long years of its imprisonment are nearly at an end. The three adventurers are about to find out that ghosts are the least of their problems. 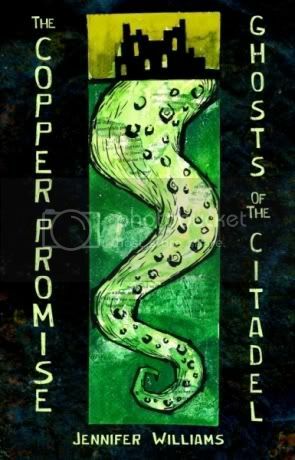 The first in a four part novella series, The Copper Promise: Ghosts of the Citadel is a sword and sorcery adventure full of danger, discovery, and dubious ale.